Hello all. Welcome to another blog from the no 1 Video Company Durban. 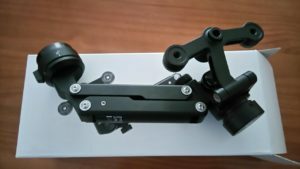 Lets talk about the new Z Axis for the DJI Osmo. Below are a few examples of the Z Axis in operation…you can be the judge of how effective the device is. Okay, so the reason for purchasing the Osmo Z Axis. I looked online for the pro’s and con’s of the DJI Osmo camera. One flaw the camera seem to have was that there was a slight vertical movement when used while walking. It was a noticeable movement which took away the fluid motion. You can definitely see the slight bobbing up and down while moving forward. After viewing the different comparisons above you can see its very clear there is quite a difference between using the Z Axis and without. Z Axis will definitely bring very clear and fluid movements to your footage from the DJI Osmo. Easy to use, no battery required, it definitely is an added advantage to include the Z Axis to your camera gear. Remember the Z Axis is eliminating the one flaw with the DJI Osmo, that is the slight bounce in the visual while operating a DJI Osmo. Next Next post: IS SA READY FOR 4K?